society’s “untouchables.” That commitment gained new clarity in Beech Grove in 1914, when St. Francis Hospital opened. The 75-bed facility was deemed “fully modern,” offering comprehensive medical services, an operating room, X-ray machine, laboratory, pharmacy and an emergency room. But vision often means looking beyond the horizon to unseen situations and challenges. By 1930, the Great Depression continued to plunge the nation to more dismal depths. Millions unemployed. Soup lines. A surging demand for charity medical care. 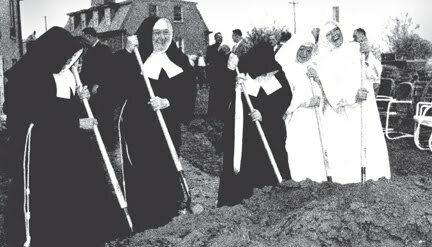 The Sisters took a bold step forward and broke ground on what would be called the South Wing, increasing the hospital’s bed count to 170, more than doubling its capacity. They also included a new Obstetrical Department, one of the most advanced of its kind. Hospital admissions soared in the decade following the construction of the new wing. In its first year, the expanded hospital served 1,805 patients. In less than a decade, admissions had grown to more than 4,100. Service was the cornerstone on which the Beech Grove hospital was built nearly a century ago. 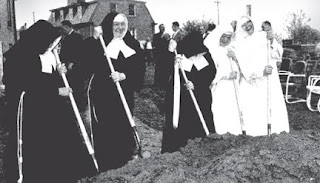 Service was the mortar that held it together and, in fact, expanded its reach to Beech Grove and Indianapolis during one of the bleakest times in the nation’s history.